While basil and pecorino pesto is the daddy, there’s a family of other possibilities that are just as tasty. 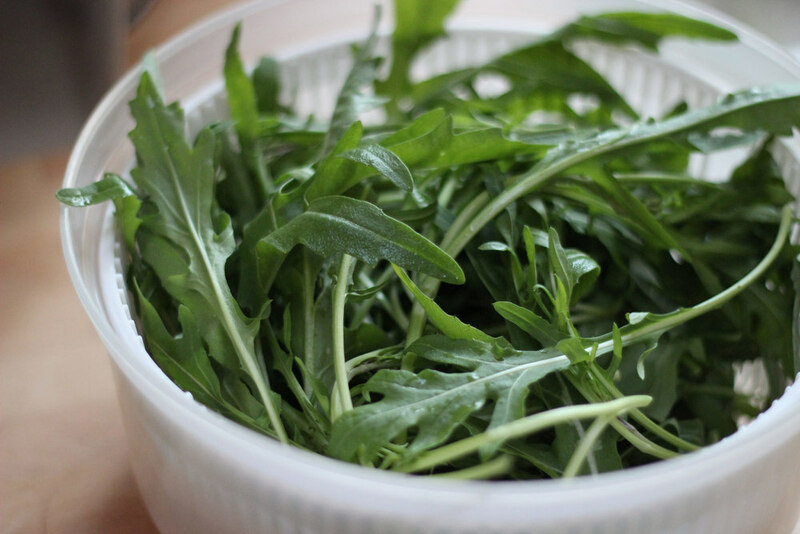 For instance, sundried tomato, black olive and watercress, and as I have made here, walnut with rocket. Fresh walnuts (ie ones that haven’t been hanging around in your baking cupboard since last Christmas) provide a rough texture and nutty flavour, mixing well with the peppery, verdant rocket. Going heavy on the Parmesan brings the flavours together perfectly, with the slinky extra virgin providing the perfect finishing touch. Stored in an airtight jar in the fridge with enough olive oil to cover the sauce will see it keep for several months. But I’m telling you now, it won’t be around that long. Now I’ve bigged up this pesto, it’s time for the sauce — and boy is it tasty. Some flavour combinations are as old as time — like egg and bacon, cheese and onion or beef and ale. And then there are more contemporary pairings that I discovered in recent years, like strawberry and anchovy, chilli and chocolate, and lemon and beef. Now, in my eyes I’ve always thought of anise flavours as being most suited to Asian cuisine, but it turns out in Italian cuisine, pork and fennel have long been great friends. It’s a new one on me and a bit of a revelation. Search the internet and you’ll find all kinds of pork and fennel recipes — whether using the bulb or the seeds, and every pork cut from tenderloin to leg to belly. You’ll even find pepperoni or salamis laced with the anise flavour in your local deli (dangerously moreish), and should you ever find yourself making chorizo sausage rolls (I beg you to give these a try), a sprinkling of fennel seeds over them before wrapping in pastry and baking is a match made in heaven. In this dish, I used skinned good quality pork sausages to create a rich ragu-like sauce that tastes as if it’s been blipping away for hours. The combination of the browned pork, fennel seeds, pasatta and wine is simple rustic deliciousness — cooked easily and fast and on the table topping your favourite pasta in well under 30 minutes. Prepare to add it to your go-to-dishes list. Into a food processor place all the pesto ingredients apart from the olive oil. Pulse until coarsely chopped then add the oil and pulse a little more — the mix should be rough-ish and not overworked (leads to it being slimy) decant into a resealable jar and set aside until it’s needed. For the pork, into a frying pan add a little olive oil on a medium-high heat and add the sausage meat to the pan. Using a wooden spoon break down the sausage meat into small pieces as it cooks, and keep turning it until it begins to brown (you want some browning, it adds to the flavour). When browning, add the onion and continue to cook for a few minutes so it softens. Turn the heat down and add the pasatta, wine, fennel seeds and black pepper, stir to combine and put a lid on — let it cook for 15 minutes, stirring occasionally to prevent sticking. Bring a pan of water to the boil for the pasta, and just before draining, put a ladle of the pasta water into the sauce along with the lemon juice and salt if required. 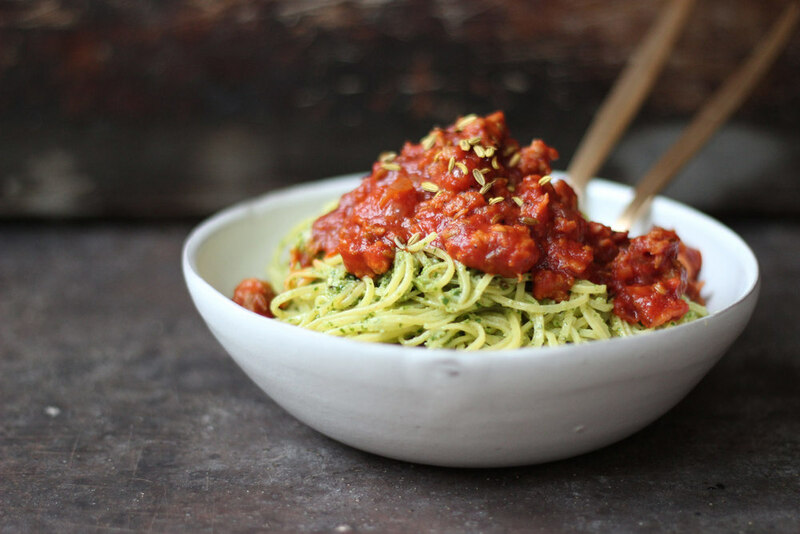 Drain the pasta and add a few dollops of the pesto and stir to combine, serve in a bowl and ladle over the sauce. Eat.